NOTE: This post is about birds that lost the ability to fly and evolved to occupy ecological niches typically associated with big mammals. In the sections that follow, we will study birds as large, terrestrial grazers (moas), as sea-going, flipper-possessing hunters of fish and krill (penguins) and as fleet-footed, land predators (phorusrhachids). The first voyagers touched land on the coast of New Zealand some time before 1300 AD. The coming of man signaled the beginning of a devastating mammalian assault on the island’s ecosystem. This isolated land-mass in the southern Pacific, where all land mammals but bats had been extinct for millions of years, was suddenly overrun with human, canine and rodent invaders from Polynesia. A wave of deforestation and extinction ensued. New Zealand’s earliest colonists belonged to a great seafaring culture with an impressive history of settling remote island chains. As they explored the land, they encountered massive flightless birds and the largest species of eagle in the world. Descriptions of these spectacular creatures survived in oral legends, centuries after they had been extirpated by hunting and habitat change. In the near complete absence of mammals, birds dominated the vertebrate fauna of New Zealand prior to human contact. Instead of ungulate browsers and grazers, there were different species of moa. Instead of small mammals foraging in the leaf-litter at night, there were nocturnal kiwis. The island’s largest predator was a raptor with a wingspan of three meters, the Haast’s eagle. In short, it was home to a truly astonishing range of avian species, from penguins to parrots. 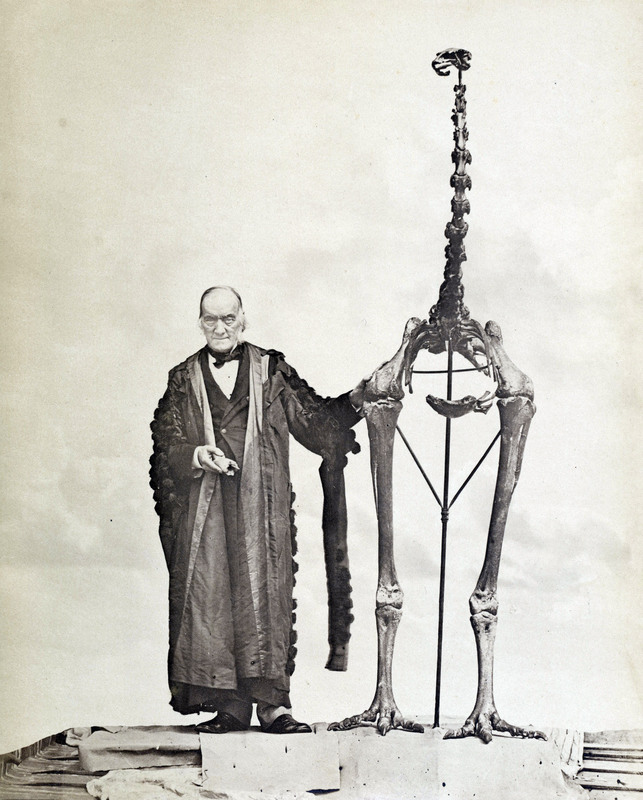 In this section, I will focus on the biology of the Moa – the most famous of New Zealand’s extinct birds. 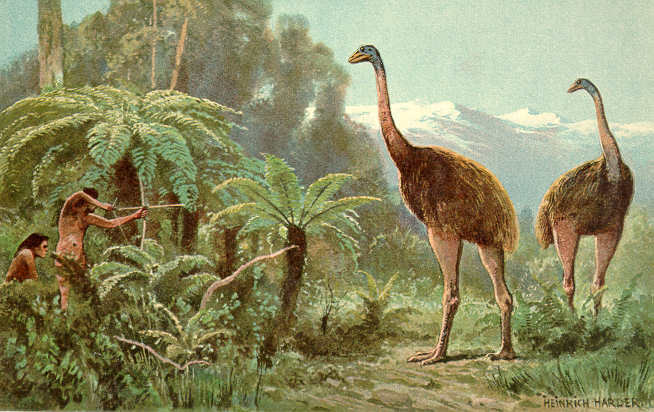 New Zealand was once home to 9 species of moa. These birds were ratites – flightless relatives of ostriches, emus and cassowaries. The defining characteristic of this group is the absence of a keel on the breastbone which, in flighted birds, serves as an attachment surface for powerful wing muscles. Ratites (and tinamous) branched off relatively early in the evolution of modern avians (Neornithes). Much controversy has surrounded the timing and nature of their divergence from the rest of bird-kind: did ratites evolve in the cretaceous, prior to the extinction of non-avian dinosaurs, or after? During the late cretaceous, the supercontinent of Gondwana (itself the southern fragment of an earlier, larger and more famous supercontinent: Pangea) split into a number of smaller continents and islands that today account for almost all of the landmass in the southern hemisphere (namely, Africa, South America, Antarctica and Australia)*. Tellingly, all modern ratites live in these southern bits of gondwana: ostriches in Africa, rheas and cassowaries in South America, emus in Australia and kiwis in New Zealand. This distribution suggests that the most recent – and presumably flightless – ratite common ancestor arose in Gondwana during the Cretaceous period. As the continents drifted apart, descendant ratite lineages “rode” the crustal fragments to their present locations, evolving in geographic isolation. However, more recent DNA evidence complicates and challenges this picture. No published molecular evolutionary tree describing the branching events between different ratite species conforms exactly to what we would expect based simply on the order of separation of the Gondwanan continents. Furthermore, an important paper (Harshman et al. 2008) nests tinamous, which are weak-flying birds from South and Central America, within the ratite clade, and identifies ostriches as the most deeply diverging ratite group. At first blush, that might appear to indicate that tinamous are ratites that somehow re-evolved flight. However, no avian group is yet known to have lost and then regained the ability to fly. A number of such phylogenetic studies have raised an intriguing possibility: perhaps the last shared ancestor of all living ratites was a bird fully capable of flight. This would imply that flightlessness evolved more than once among ratites – and that the keel-less breastbones and non-functonal wings of ostriches and emus may actually be an astonishing example of parallel evolution. The global distribution of ratites may be best explained by volant ancestors dispersing across bodies of water and by independent losses of flight in different lineages. Polynesians hunting a giant moa. Painting by Heinrich Harder. The moa head was small relative to body size. They had long necks and stout legs. Moas were unique among flightless birds in lacking even vestigial wings. At a height of 3.6 meters, the Giant Moa towers over the biggest of its extant relatives, the ostrich. The only birds that are known to have surpassed the largest moas in weight were the elephantbirds of Madagascar – another group of giant, island ratites that went extinct within the last millennium. The smallest species of moa approximated the size of a turkey. Moa were herbivores that lived in or on the edges of forests, feeding on twigs and branches from low trees and shrubs. Like all other birds, they possessed a gizzard – a stomach chamber with thick, muscular walls containing stones that the bird swallowed to aid in digestion. Driven by powerful muscular contractions, these stones helped grind down ingested plant material. Gizzard stones are the functional equivalent of mammalian teeth. Moa did not live in a world free of natural predators. 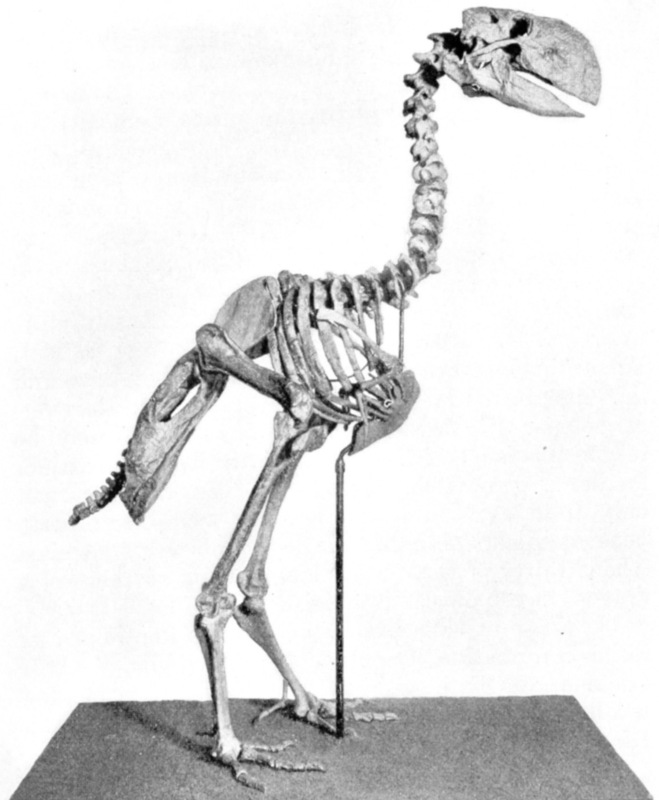 In the 1870s, half a century after the first moa bones were described by European scientists, a number of bones were discovered at a moa-excavation site that seemed to belong to giant bird of prey. This bird, called the Haast’s eagle, had a wingspan that exceeded that of any living raptor or vulture. It is thought to have preyed on moa. Watching one of these eagles swoop down on and dispatch a moa several times its size would have been a sight indeed! The Haast’s eagle preyed on moa. Artwork by John Megahan. Within a century of polynesian arrival, the Moa was hunted to extinction. The decimation of New Zealand’s forests also played a role. By the time the first Europeans set foot on the island, the moa was only a distant mythical-cultural memory to the Maori. The six living genera of penguins (and their various extinct relatives) together constitute the avian order Sphenisciformes. They are undoubtedly the most aquatically-adapted of all birds. Studies have revealed the body-form of a penguin to be among the most hydrodynamic shapes in the animal kingdom. Its wings have evolved into stiffened flippers that are optimized for generating thrust underwater. Their webbed feet, which serve as the primary source of propulsion in many other diving sea-birds, are used for steering rather than paddling when underwater. It has densely-arranged, short feathers that serve to insulate and make the animal waterproof. It has dense bones that allow it to resist buoyancy and dive deep in pursuit of prey. Emperor penguins, for example, are capable of diving down to over 1,800 feet. Many species forage for krill, squid and fish hundreds of kilometers away from the location of their home colonies. While penguins are typically imagined to be remote denizens of frigid Antarctic coasts, they are actually found throughout the Southern Hemisphere. Consider that Galapagos penguins cross the equator on a regular basis! The oldest known Sphenisciforme fossils date to the Paleocene, around 60 million years ago, not long after the demise of the non-avian dinosaurs. These bones belong to the species Waimanu manneringi, a long-billed, flightless water-bird with forelimbs that show some signs of adaptation toward wing-propelled swimming. It probably used its feet to actively propel itself, rather than employing them simply as a rudder like modern penguins. Its skeleton presents an early stage in the anatomical evolution of penguins. Interestingly, a number of gigantic penguin species have been discovered from the Eocene (56-33 mya) and Oligocene (33-23 mya) periods. Like ratites, the Sphenisciformes were able to experiment with larger body-sizes once they abandoned flight. Anthropornis, the tallest of them, stood at about 5 feet and 7 inches. Its wings were not as straight as those of modern penguins. Icadyptes, another one of these fossil giants, possessed an elongate, spear-like beak for skewering fish and may have been a strong diver. One interesting, if largely speculative, hypothesis posits that rising competition for food stocks and predation pressure imposed by the emergence of new lineages of whales and pinnipeds (i.e. seals) during the Oligocene drove giant penguins to extinction. By a similar token, perhaps the earlier extinction of large marine reptile groups after the cretaceous period opened up fresh new watery niches for early penguins to exploit. While the Sphenisciformes as a whole are certainly a very ancient group, all living penguin taxa trace their descent to an ancestor that lived only 10-11 million years ago. In an interesting evolutionary parallel, auks in the northern hemisphere independently evolved wing-propelled swimming, an upright posture and black-and-white colors. Living auks are generally inefficient fliers – having traded in much of their flying ability for swimming prowess – but none of them are flightless. The great auk is an extinct member of the group that was flightless and disappeared only 150 years ago. Curiously, the word “penguin” was originally applied to this species of auk, prior to the discovery of what know today as penguins by western explorers. South America was an island continent for nearly all of the Cenozoic era (i.e. the last 65 million years). While elephants, horses, camels, cats, dogs and bears were evolving in and dispersing throughout the Old world and North America, South America’s mammal fauna remained isolated and evolved in its own distinct fashion. The land mass was once home to elephant-sized sloths, the marsupial equivalents of ‘saber-toothed’ cats, and many strange and unique ungulates. These fascinating creatures will be the subject of a future post. South America was also home to a clade of large, flightless birds with a predilection for meat- the Phorusrhacids. Their closest living relatives are two species of seriema – long-legged, mostly-terrestrial, carnivorous birds native to the same continent. Unlike some other candidate “Terror birds” from the fossil record, like the Mihirungs of Australia or the Gastornithiformes, there has been relatively little debate about whether or not Phorusrhacids were predators. They had large skulls with tall, laterally-compressed and strongly- hooked beaks. The neck was not built to withstand side-to-side stresses (so these birds could not snag and then violently shake their prey), but could mete out powerful downward strikes. The biggest known Phorusrhacids were around 3 meters tall. Large phorusrhacids are often described as being agile pursuit hunters. Their legs might have also been employed in kicking prey to death, a tactic used to great effect by the secretary bird, a living terrestrial bird of prey in Africa. South America’s long isolation ended when the Isthmus of Panama formed 4.5 million years ago, connecting the continent to North America. This inaugurated a fascinating period of inter-continental animal migrations that permanently changed the faunal composition of South America. Northern species were generally more successful in invading the south than vice-versa. The phorusrhacids did manage to spread north of the isthmus and the remains of one impressive species, Titanis walleri, have been recovered from Texas and Florida. They went extinct not long after this event (perhaps succumbing to competition from a host of new carnivorous mammalian rivals) about 2 million years ago, well before humans entered the New World. Phillips, Matthew J., et al. “Tinamous and moa flock together: mitochondrial genome sequence analysis reveals independent losses of flight among ratites.”Systematic biology 59.1 (2010): 90-107. Smith, Jordan V., Edward L. Braun, and Rebecca T. Kimball. “Ratite nonmonophyly: independent evidence from 40 novel loci.” Systematic biology62.1 (2013): 35-49. Worthy, Trevor H., and Richard N. Holdaway. 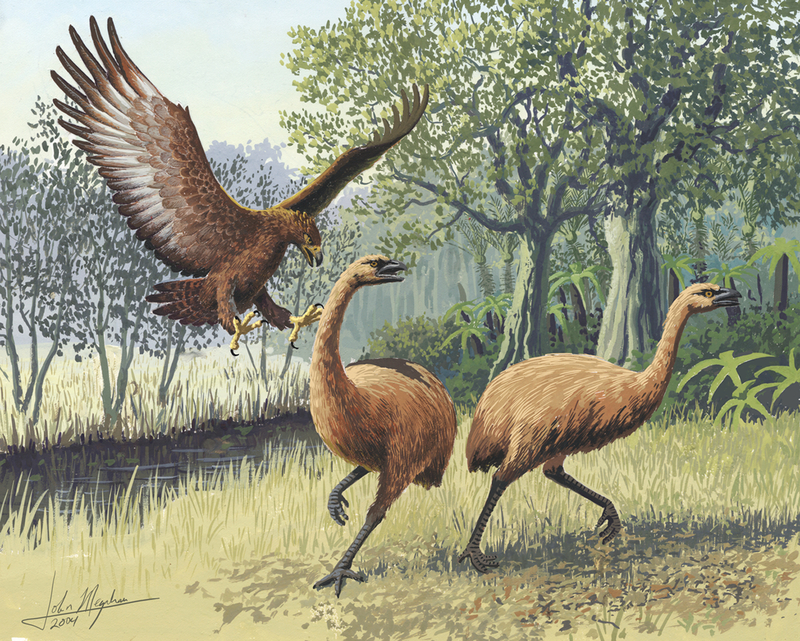 The lost world of the moa: prehistoric life of New Zealand. Indiana University Press, 2002. Dyke, Gareth, and Gary Kaiser, eds. Living dinosaurs: the evolutionary history of modern birds. John Wiley & Sons, 2011. Degrange, Federico J., et al. “Mechanical analysis of feeding behavior in the extinct “terror bird” Andalgalornis steulleti (Gruiformes: Phorusrhacidae).” PloS one 5.8 (2010): e11856. *India and Arabia are portions of Gondwana that have moved entirely into the northern hemisphere. 2, 3, 3, 3, 3. That’s the number of bones in your thumb, index finger, middle finger, ring finger and little finger respectively. The same numbers apply to the phalangeal bones in your toes, starting with your big toe. This basic structural plan (common to most land mammals) has a very ancient pedigree – the therocephalia, a group of carnivorous “mammal-like reptiles” that walked the earth over 250 million years ago during the Permian period, had hands and feet constructed in just this fashion. 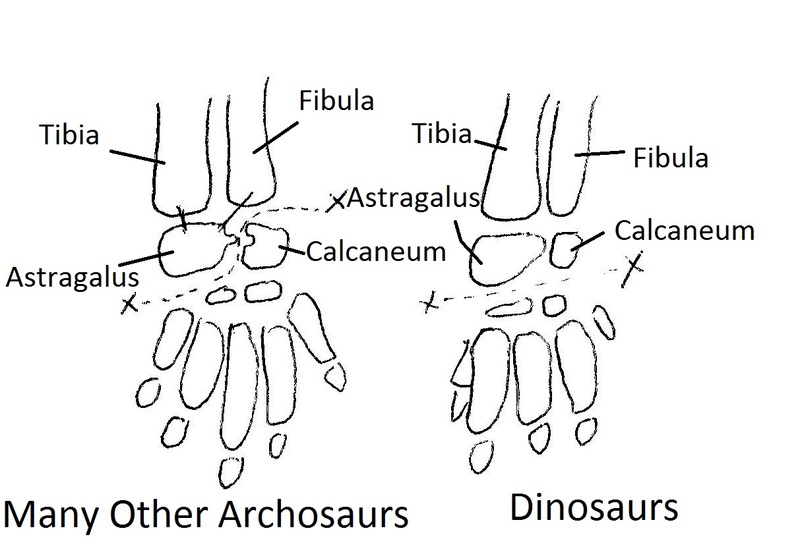 Four out of the five digits on each extremity contained 3 bones while the remaining digit (corresponding to the thumb or big toe) contained only 2. Many of the most unique and widely conserved features of mammalian anatomical design and physiology – including a bony secondary palate, a three-ossicle ear, endothermy, an erect limb-posture, and quite probably hair and lactation – originated among ancestral groups of “mammal-like reptiles” during the Permian and early Triassic periods. Much of this series will be concerned with ‘bridging’ some of the ‘evolutionary distance’ that separates the pelycosaur Haptodus (left, by Nobu Tamura) from the early mammal Morganucodon (right, by Michael B. H.). So how did the evolutionary process derive a class of highly active, fur-clad, milk-producing animals from ancestral forms that were so fundamentally reptile-like in appearance? This is the question that I shall attempt to answer in a series of posts over the course of this winter. We discussed the biology and classification of some of the earliest “mammal like reptiles” in my post on Pelycosaurs. In this post, we shall begin to deal with their Permian heirs, the Therapsids. The first few installments of this series will deal with specific groups of mammal-like reptiles that lived during the Middle and Late Permian, while the remaining parts will deal with some of the long-term evolutionary ‘trends’ we can glean from the Therapsid fossil record. 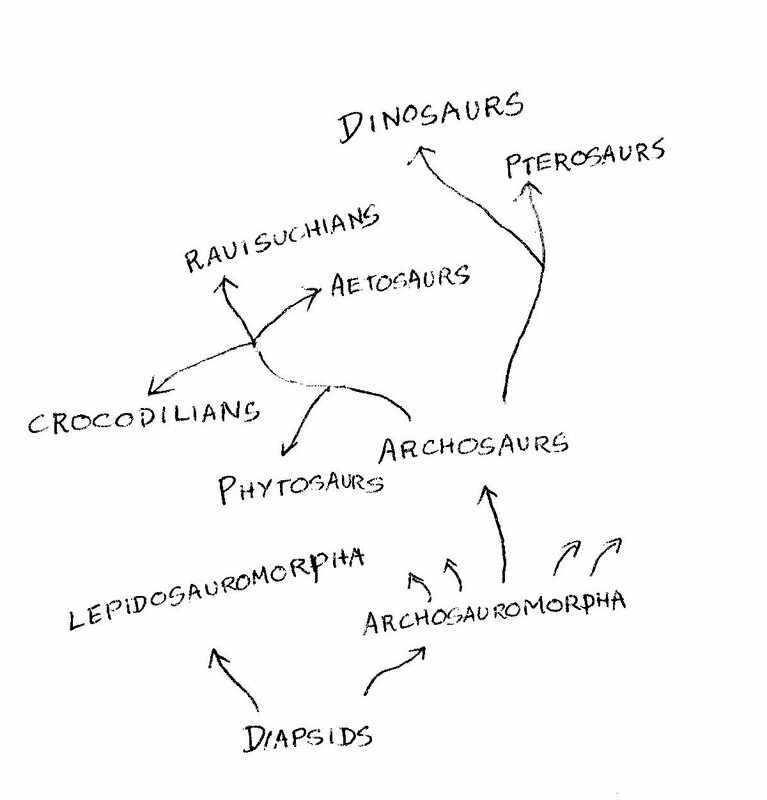 A very crude evolutionary tree. The word clouds around the ends of each of the branches represent different terms and animals associated with the taxonomic grouping. – Birds, mammals and modern reptiles are amniotes by descent. The first amniotes were terrestrially-adapted animals that laid water-proof eggs on dry land. – Synapsida is a subgrouping of amniotes that includes modern mammals and their various extinct proto-mammal ancestors and relatives, but excludes birds and reptiles. Early synapsids can be distinguished from other groups of amniotes in the fossil record on the basis of a number of skeletal features, the most important of which is the presence of a single hole on each side of the skull behind the eye-orbit. These holes are called temporal fenestrae. By contrast, other early amniote skulls bear either no holes (anapsids), two holes (diapsid) or a single highly placed hole (euryapsid, similar to the synapsid condition, but differing in the location of the hole) behind each eye-orbit. The temporal fenestrae provide secure anchorage points for muscles associated with jaw function. Mammals are the only surviving synapsids. 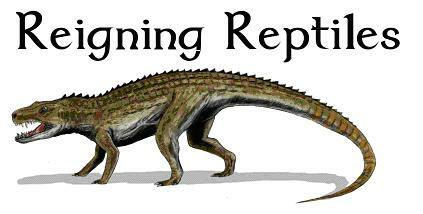 – ‘Pelycosaur‘ is a somewhat informal term applied to a range of basal/’primitive’ non-mammalian synapsids. What differentiates early Therapsids from pelycosaurs? The most important differences lie in the anatomy of the skull. Therapsids have larger temporal fenestrae than pelycosaurs. 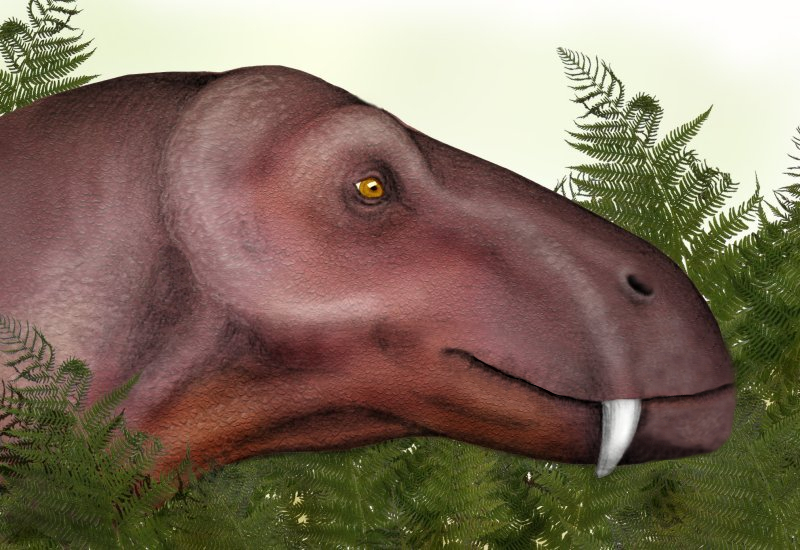 An enlarged canine-like tooth is present on the lower and upper jaws of Therapsids, clearly demarcating the boundary between a set of incisor-like teeth in front and a set of post-canine teeth behind. Heterodonty – or the presence of morphologically distinct sets of teeth in the jaws (e.g. incisors, canines, molars, premolars) – is one of the signature features of mammalhood. Most bony fish, amphibians and modern reptiles have ‘homodont’ teeth that are essentially morphologically identical. The back of the skull in Therapsids is also more vertical and the jaw-joint is more anteriorly placed than in pelycosaurs. The mammalian jaw consists of a single bone – the dentary. 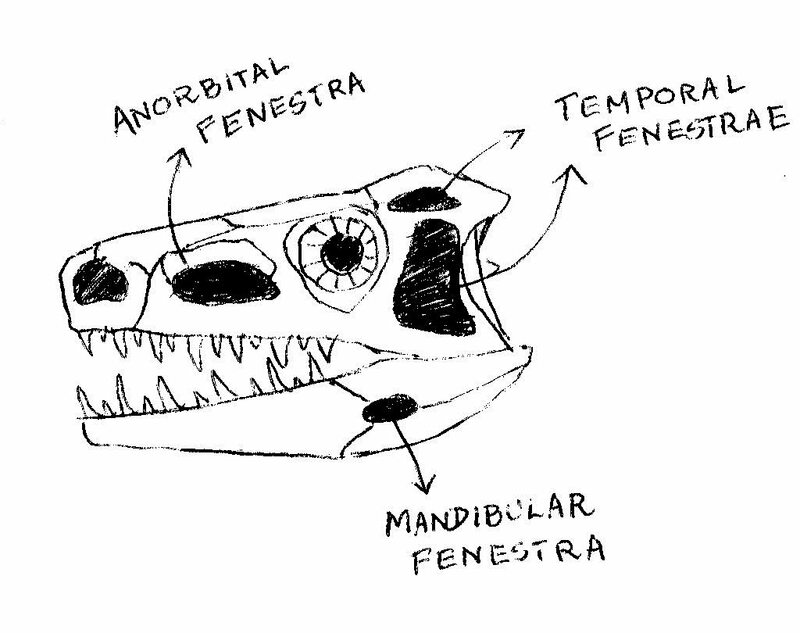 Earlier Therapsids had jaws constructed from a number of bones in addition to the dentary, including the angular bone (refer to diagram). One diagnostic feature of the therapsid jaw is the presence of a wide leaf of bone called the “reflected lamina” that protrudes from the angular. The reflected lamina may have played some part in hearing. We will discuss the evolution of the mammalian auditory system in a future post in this series. 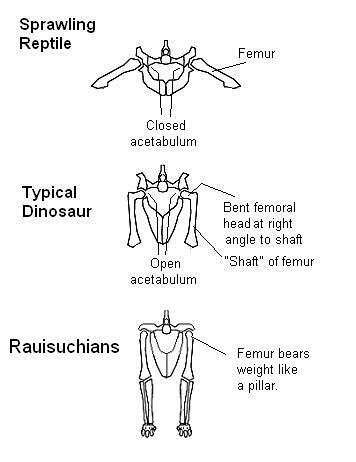 The post cranial skeletons of early Therapsids show signs of improved locomotory ability. They appear to have traded in the permanent sprawling posture of their pelycosaur ancestors for a more erect gait and developed shoulder and hip joints that permitted a greater range of limb movements. Most of the traits listed above were present in some incipient form in one group of Pelycosaurs in particular- the Sphenocodontidae. This group includes the famous sail-backed Dimetrodon. The Sphenocodontids are nearly universally posited as the closest relatives of the Therapsids. Note: A few terms may need some clarification. The Mesozoic era can be thought of as the “Age of Reptiles” – a span of time running from 250 to 65 million years ago, during which reptiles were the dominant terrestrial vertebrates. The Cretaceous period, which lasted from 145 to 65 million years ago, represents the final subdivision of this era. 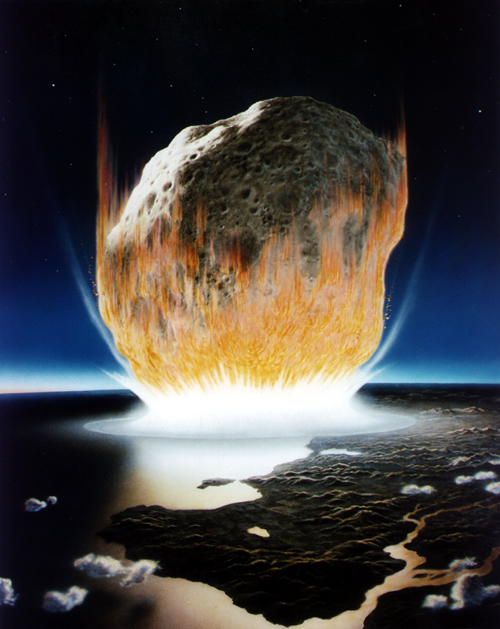 In terms of gross energy yield, the simultaneous detonation of every atomic weapon on earth would be a puny sputter compared to the asteroid impact that brought an end to the reign of the dinosaurs. The collision event ejected massive quantities of debris and dust into the atmosphere, blotting out the sun. Ecosystems worldwide were subject to wild-fires, acid-rain, reduced plant/phytoplanktonic productivity and plummeting temperatures. Most of the large reptilian faunal groups that dominated the land and seas of the Cretaceous – non-avian dinosaurs, mosasaurs, pterosaurs and plesiosaurs – were wiped out forever. The K-T extinction event will be dealt with in more detail in a future post, but this section of finstofeet will focus on the brave, new Paleocene world that rose from the ashes of the Cretaceous. How did life on land recover after the dramatic demise of the dinosaurs? Although the Paleocene forests were home to many strange and unfamiliar creatures (the remains of galloping crocodiles, shrews with trunks and kangaroo-like legs, hoofed predators and man-sized carnivorous birds have been unearthed from this period, along with other zoological oddities) they also bore the seeds of mammalian modernity: the Paleocene epoch saw the appearance of the earliest representatives of many present-day mammalian orders, including rodents, primates, ungulates and carnivorans. 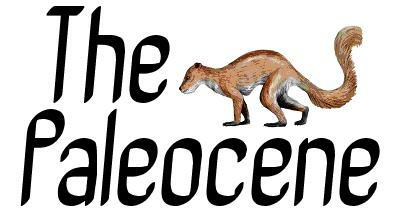 What was the Paleocene? Did any modern mammal groups exist before the Paleocene? The ‘Paleocene’ refers to the geological epoch that immediately followed the mass-extinction of the dinosaurs at the end of Cretaceous period. It lasted from 65.5 million years to 56 million years ago. The first mammals of roughly modern aspect arose well before the end-Cretaceous extinction event, perhaps around 200 million years ago. Mammals in the age of reptiles were, as a rule, diminutive creatures – most of them were rodent-sized insectivores. A great majority were exceeded in size by even the smallest non-avian dinosaurs in their environment. A scant few attained dimensions comparable to the modern beaver or house cat. 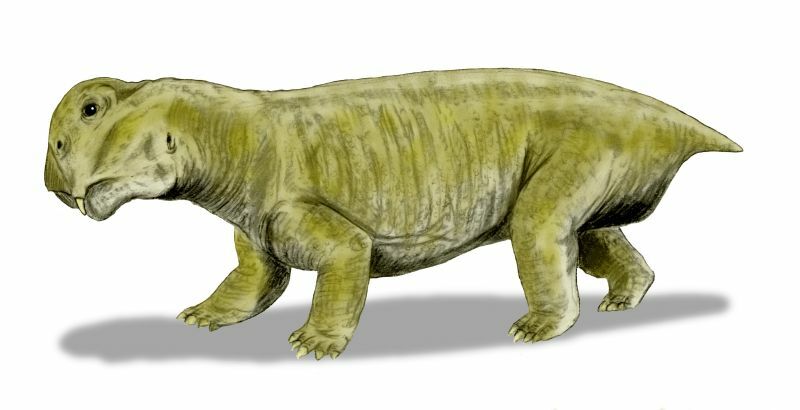 Repenomamus, the largest known mammal from this time period, was about a meter in length and is known to have preyed on small juvenile dinosaurs. There are examples of Mesozoic mammalian forms specialized for a semi-aquatic lifestyle, for ant-eating and even for gliding flight, but these are exceptional cases – most mammals of the age displayed rather unspecialized skulls, dentitions and skeletons. Repenomamus, the largest known mammal from the Mesozoic, sating itself on a dinosaur hatchling. Art by Nobi Tamura. For much of the Mesozoic, the mammals appear to have languished in a kind of evolutionary purgatory – restricted to a relatively small number of morphological types and ecological niches over an immense stretch of geological time. It is generally thought that the dinosaurs competitively excluded mammals from the medium-to-large predator and herbivore niches. Three major groups of mammals carried over into the Paleocene from the Cretaceous period. The placenta is a complicated mammalian tissue that serves as the interface between the maternal uterine wall and the developing fetus. It anchors the fetus to the uterus, supplies the growing embryo with oxygen and nutrients and eliminates the metabolic waste produced by it. It also acts as an important endocrine organ. Placenta-bearing mammals probably emerged around the middle of the Mesozoic and are represented today by over 5000 species, from elephants to humans to bats. These animals display a long gestation period and give birth to well- developed live young. Early placental mammals in the fossil record are recognized on the basis of certain shared features of the teeth, jaws, leg bones, foot bones and ankle joints (naturally, the presence or absence of a soft organ like the placenta cannot be used as a diagnostic tool when working with fossils). The Marsupial clade also arose in the Mesozoic and managed to persist into the modern world – though its contribution to the present-day range of mammalian diversity is meager compared to that of placental mammals (there are a total of only 343 known marsupial species, mostly distributed in Australia and South America). Marsupials are popularly thought of as ‘pouched animals’ – in fact, the very name comes from the latin word for pouch, marsupium – but only 50% of living marsupial species actually possess a permanent pouch. Marsupials can more properly be distinguished from their placental counterparts on the basis of their reproductive cycle: Marsupials possess only a rudimentary placenta, with limited nutrient and oxygen exchanging capabilities. They have short gestation periods and give birth to tiny, incompletely developed young. The younglings are nursed on breast milk for an extended period of time (the lactation period far exceeds the gestation period). Subtle features of the upper and lower molars, in addition to the total number of molars in each jaw, also distinguish marsupials from placental mammals. Marsupials generally have lower metabolic rates, slower rates of postnatal growth and smaller brain dimensions than placentals of comparable size. Adding to the mammalian diversity of the late cretaceous was a group of primitive, essentially rodent-like mammals called the Multituberculates. The clinical-sounding name refers to the fact that each cheek tooth in the jaws of these animals bore multiple rows of tiny cusps (bumps) or “tubercules” that operated against similar counter-rows in the opposite jaw. Like modern rodents, they bore a pair of enlarged shearing incisors at the front of each jaw. In terms of geological longevity, it could be argued that they were the most successful mammalian order of all time, lasting for a span of over 120 million years. Marsupials and Placental mammals are much more closely related to one another than either is to the Multituberculates. Judging from the structure of the pelvis, it seems very likely that Multituberculates gave birth to immature, live young rather than laying eggs like their reptillian forebears. Unlike the marsupials and placental mammals of the Mesozoic, the Multituberculates left behind no living descendants. It is worth mentioning here that a group of primitive egg-laying mammals, the monotremes, also made it into the Paleocene. They are represented today by just one species of Platypus and four species of Echidna. The sudden disappearance of the dinosaurs opened up a plethora of new niches for the mammals to radiate into. The world was warmer and wetter in the Paleocene than it is today, with rainforests ranging over most of the continents. The continents themselves, while not entirely alien in shape and extent, occupied markedly different longitudinal and latitudinal positions in the Paleocene than they do today. A map of the world at that time is included below. So we’ve set the stage. What sorts of mammals could we paint into a Paleocene landscape? The marsupials appear to have undergone a significant reduction in diversity at the Cretaceous-Paleocene boundary – only one genus, Peradectes, is known to have made it across successfully. The placentals and multituberculates sustained fewer casualties by comparison. The explosive diversification of mammalian morphotypes to fill ecosystems effectively emptied of large vertebrates did not begin immediately after the fall of the dinosaurs. For example, it was only towards the end of the Paleocene epoch that the first truly large-bodied mammal herbivores and carnivores began to arrive on the scene. Agusti and Anton’ (2002) go so far as to describe much of the Paleocene as being “an impoverished extension of the late Cretaceous world”. Any overview description of the mammals of this period is destined to devolve into a tiresome catalogue of strange names and anatomical characters. I have tried my level best to supplement my writings with pictures to help you visualize the animals I describe below. The Multituberculates (hereafter shortened to ‘multis’) reached the peak of their evolutionary fortunes during the Paleocene. The Ptilodonts can be regarded as typical Multis – they had large, rodent-like incisors perched at the front of each jaw, separated from the cheek-teeth by a toothless space. They had elongated blade-like lower premolars, designed for cracking nuts and hard seeds. Like most Multis, the Ptilodonts appear to have been largely herbivorous, perhaps supplementing their diet with the occasional invertebrate. Ptilodonts had grasping claws, a prehensile tail, large toes and feet with a wide range of motion. These traits indicate a heavily arboreal lifestyle. In summary, the Ptilodonts were squirrel-like animals, both ecologically and morphologically. 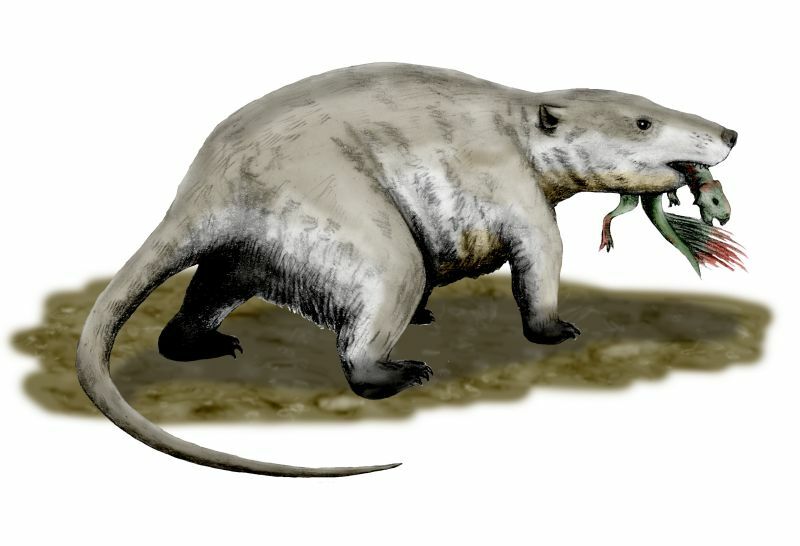 The largest known multi approximated the size of a beaver – the short-snouted, heavily built Taenolabis. It had large grinding molars and was clearly a ground-dwelling herbivore. The Multis ultimately bought the farm about 30 million years ago – succumbing, perhaps, to stiff competition from true rodents, primates and herbivorous ungulates. The transition into the Paleocene was turbulent for the Marsupials and they never truly recovered their former level of diversity in the Northern Hemisphere. The southern continents, however, were a different story. Marsupials formed a sizeable chunk of the mammalian fauna in Paleocene South America (up to 50%). A number of these Marsupials can be characterized as belonging to the same taxonomical order as modern opossums. Some of these were adapted for burrowing, others for scaling trees. Interestingly, marsupial equivalents of rodents and carnivorans also evolved in South America during the later phases of the Paleocene. 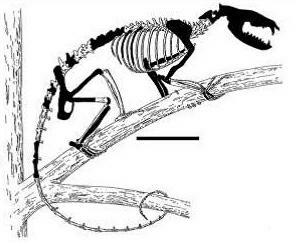 The weasel-sized arboreally-proficient marsupial Mayulestes probably sought out frogs and small mammals as prey; It was similar, in many ways, to the marten. Placental mammals, piddling contributors to the range of mammal diversity for most of the Mesozoic, managed to outshine both the Multituberculates and the Marsupials during the Paleocene. We shall consider several unique and interesting placental animal groups that lived in the Paleocene in the following passages. The Lepictids – It is tempting to observe the tiny sizes, small brain-cases, pointed snouts and insectivorous diet of hedgehogs, shrews, golden moles, elephant shrews, treeshrews, tenrecs and moles and conclude that they all belong to a single taxonomic category of mammals. This is not really the case, and molecular analyses – as well as studies in comparative anatomy – demonstrate that these 7 animals represent up to five different mammalian orders: Erinaceomorpha (hedgehogs), Soricomorpha (shrews and moles), Macroscelidea (elephant shrews), Scandentia (treeshrews) and Afrosoricida (tenrecs and golden moles). The tree-tops and underbrush of the Paleocene were home to a great many such small-to-medium sized insectivorous creatures, representing different genera, families, orders, superorders, infraclasses and subclasses – a number of these (in South America, at least) were marsupials, others were Multituberculates and some were early members of the currently existing placental orders listed in the previous paragraph. Still others belonged to placental families and orders that kicked the bucket by the end of the Paleocene: the long-legged lepictids, the shrew-like paleoryctids or the semi-aquatic, fish-eating, otter-like pantolestids, for example. One of the most charismatic placental mammals recovered from the Paleocene is lepictidum – a sort of strange cross between an elephant-shrew and a kangaroo. It was about 60 to 90 centimeters long, had lengthy hind-limbs, shortened fore-limbs and a slender snout that sported a short trunk. Like many other mammalian insectivores, the skull was quite unspecialized. It is unclear whether this animal ran on all fours or hopped like a wallaby. And yes, as fossil genera go, Lepictidum is unbelievably cute. The video below represents one animator’s impressive attempt at bringing this animal back to life. Plesiadapiforms – We can tease out the beginnings of our own order, Primata, from amidst this Paleocene profusion of tree-climbing and insect-munching forms. Modern Primates share a number of features: among them, a short muzzle, forwardly directed eyes with stereoscopic vision, hands with nails rather than claws and cheek teeth with rounded cusps. Most Plesiadapiformes display none of these characters, possessing a long snout, strong, curved claws and side-facing orbits for the eyes. They can, however, be related to primitive tarsier-like primates mostly on the basis of shared features of the teeth and the auditory bulla, a bony structure that encloses the bones of the middle ear. It is likely that they were close relatives of true primates, if not directly ancestral to them. They were extremely abundant in the Paleocene and are interpreted as being lemur-like in appearance. They had long digits and flexible limbs for maneuvering through the forest canopy. Over 25 genera and 75 species of Plesiadapiformes have been discovered from this period – leaping about the tree cover as far north of the tropics as northern Wyoming, which was warmer and less arid during the Paleocene. Condylarths – Primitive ungulates, called Condylarths, also existed in the Paleocene. Many of them bear little semblance to modern hoofed animals like horses or deer. 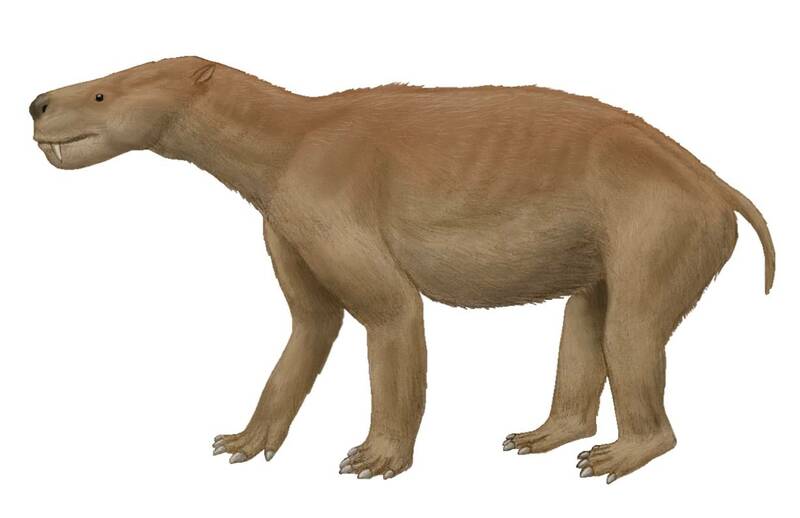 For example, Arctocyon was a wolf-sized condylarth with the limb proportions of a bear and a diet that included meat. It had a pair of impressive lower canines and a long, robust skull. Its cheek teeth indicate that it was primarily a plant-eater. It is identified as a primitive ungulate by subtle features of its limb joints and dentition. Dissacus was another example of a condylarth that consumed meat. It had digits that terminated in hoof-like structures. Many different groups of condylarths have been recognized in the fossil record. Some of the Condylarths were browsers like Ectoconus or Phenacodus, and possessed clear signs of tapir-like hooves. Some of these animals were well-adaptated for running. The condylarths are generally regarded as being the basal ancestral stock from which the odd and even toed ungulates arose. By the end of the Paleocene, various large bulky herbivores appeared on the scene – some of them Condylarthian in origin and others not. Titanoides was a strange non-condylarthian herbivore that approached the size of a Rhinoceros and had giant saber-like canines and long forelimbs. The earliest civet-like ancestors of dogs, cats, hyenas and bears also evolved in the Late Paleocene – though their story will be told in another section of finstofeet. It is astonishing how many wildly different lineages – ptilodonts, marsupials and plesiadapiformes, among others – evolved chisel-like incisors and rodent-like skulls during this epoch. True rodents arrived onto the scene at the end of it all, competing with and ultimately eclipsing the various pseudo-rodents of the Paleocene. Were there any large non-mammalian predators during the Paleocene? One of the most unusual aspects of the Paleocene was the presence of large predatory birds and reptiles that occupied the topmost rungs of the food-chain in terrestrial ecosystems across the world. The K/T extinction event did not put the dinosaurs out of business entirely; they were survived in the succeeding age by birds (some aspects of the dinosaur-to-bird transition have already been dealt with in the ‘Taking Wing’ series). Fossil evidence suggests that birds weathered the Cretaceous-Paleocene transition poorly, with only a few taxa escaping extinction. These surviving forms eventually gave rise to all the different families of birds that we currently observe. 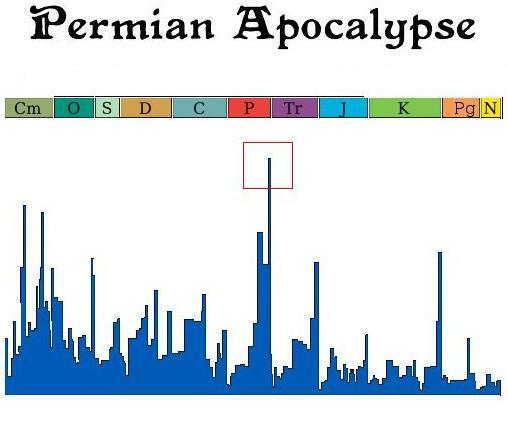 There is molecular data that contradicts this picture, pointing to a pre-K/T event divergence for many of today’s major bird lineages. In any case, by the late Paleocene, one group of birds had lost the ability to fly and assumed the form – in likeness of some of their extinct theropod relatives – of large, land-bound, predaceous bipeds: the Gastornithidae. These “terror birds” were up to 2 metres tall and small, non-functional wings. They had large, powerful beaks for capturing and tearing prey apart. It is often depicted as feeding on carrion and mammals. They are related to modern waterfowls. Update/Correction (January 2013): Some recent evidence seems to suggest that the Gastornithidae were actually herbivores! 1. Agustí, Jordi, and Mauricio Antón. Mammoths, sabertooths, and hominids: 65 million years of mammalian evolution in Europe. Columbia University Press, 2010. 2. Prothero, Donald R. After the dinosaurs: the age of mammals. Indiana University Press, 2006.